This entry was posted in Friday Fictioneers and tagged Bjorn Rudberg, end of the road, guerrillas, Rochelle Wisoff-Fields, signs. Bookmark the permalink. No wonder Jill’s reluctant. She remembers what happened last time she went up the hill with Jack. Now we’ve got four men with machine guns. Her luck’s out again. Exactly! Why she didn’t listen to herself…. Only a Jilly would know what really happened on a hill with Jack. I never really believed that old story about getting a pail of water. Indeed. Taking chances in far-off places. If she’s lucky and doesn’t get pushed over as well! 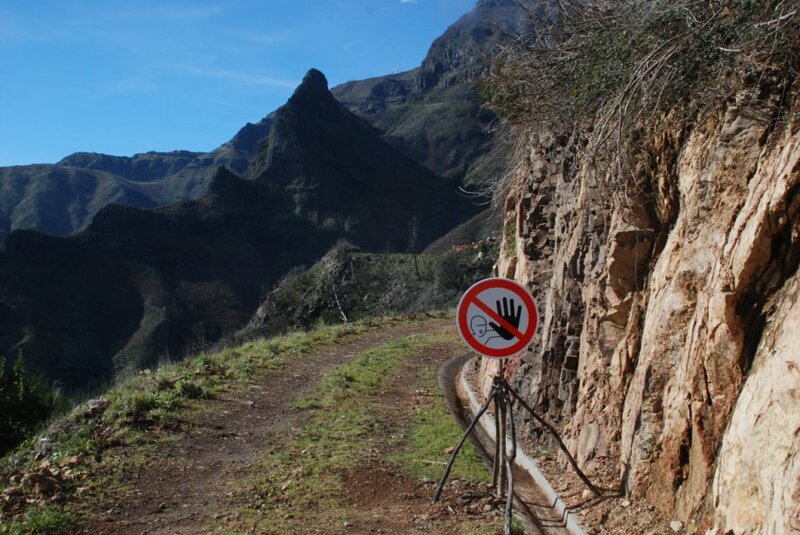 A friend of mine went to Colombia with his friend they willingly took a road that said: Do no go past this sign, people get kidnapped or worse. And they took it anyway. Got around a bend and saw at the top of the hill, a man with a machine gun. The started backing up when another popped up beside them. They yelled so loud the guy stepped back and fell into the ditch. They then sped, backwards, back to the main road! Nuts, I tell ya, totally nuts! A modern spin. I assume they still come tumbling down pretty quick! The worst part, is, since I’ve posted this, a great poem has popped into my head… ah well… next time! This would have been a hard one for me because no initial thoughts popped into my head. Then again, at least Jack and Jill didn’t roll down the hill. Well now… I shall reserve you once per month, sir… You got last week! As he dragged Jill along for good measure! Then around the bend they found a cave to participate in some pleasure. Oh well …. sometimes the idea comes a little later. Well, I guess that trip was either abruptly cut short – or extended until someone raised the ransom! Yep, two more idiots…question though: how hard was it to not finish with “Jack fell down and …”? That’s for sure! A friend of mine did something this stupid in Colombia. Thankfully he made it back alive but not his smartest move. They really can. And with so many beautiful and friendly countries out There, why choose the dangerous ones? If your name is Jill, make sure you unfriend all Jacks. BTW, what were those guys doing there with their machine guns? Jack had to try the same thing twice didn’t he… maybe they will be sent back the hill walking this time. I pay attention to signs, usually. And thank Gawd for GPS, because now I NEVER have to get out of my car again in the event (when) I get lost. I’ve never had someone point a gun at me after I disobeyed a sign, but that’s only because I don’t allow peeps in my car with firearms. Seriously. GPS has saved more than one couple in a car, to be sure! Mick hated getting lost so much he preferred to stop and ask for directions – 20 times, if need be! See my response to Frank about a friend of mine! Mick was some kind of fella. He stopped more times in one trip than I have in my entire life! The only time I break into a sweat is when I have to pass through D.C.. That place is a fracking nightmare to drive through! Not much of a tour guide, but he will get you where you’re going, lol! Bwahaha! I had to look. machine guns seemed to be an overkill. but, hopefully, they were good guys protecting the mountain pass. Yeahhh… I don’t think so… but I like your optimism, Plaridel! Ooops! One MUST pay attention to signs! Oops. Not a good thing to find around the bend. Sorry…couldn’t help but go there. Nope… definitely not a good thing to find! I think instead of putting up a sign that says Stop, or No Trespassing. They should erect one that says. “Come on in, we’re fixin’ to kill you.” Feel free to add “eh?” to the end of that statement if you want. I dunno. If they do like my friend, they backtrack pronto!! I think they’re in way over their heads now. The future is not looking bright. It so isn’t Sandra. Methinks they are in a load of trouble. Great way to tell a story, with a follow up in the comments. I found this highly entertaining. to me the moral was, you don’t know what’s round the bend in life until you take the next step. Sometimes it’s a lot smarter to obey the sign. I imagine this continues with Jill saying that yes, of course she saw the sign but Jack decided he knew better. A great tale for the prompt. And Jill knowing full well he (they) would pay for his knowing better. That stop sign. Those rules. Rip them up, I say, before you go around the bend, then you won’t end up going round the bend, if you know what I mean? A bit of tongue-in-cheek- humor with the JJ’s. Oh, you funny gal, Dale. I had it all figured out until the rifles. Woman should never listen to men. They never know where they’re going. I hope Jill doesn’t give Jack a little push. It could be painful with all those jagged mountain edges. Great story …. have a special FUN weekend. LOL! So very funny, Izzy! I think she’s wishing she did…. Same here! In the moment, you think you are nuts… after, it’s like.. cool! No, apparently they won’t!! I’ll check them out. And that’s why Jack came tumbling down. It was dem machine guns! Dang. I shoulda! Would have changed the whole story!! Sometimes they are the best part, don’t you think? I love this community…. Very clever and dark take on the nursery rhyme. Worked very well. LOL. Looks like it is not only Jack that is in for it this time. I doubt if they escape Jill will venture up a hill with him for a third time – or she might think third time lucky. Good fun take on the prompt. Glad you LOLed! 😉 Methinks Jill will not be fooled a third time – IF they get out of this sticky situation! A well told tale- I wanted to tell Jill – trust your own judgement ! Now THAT was unexpected! With “Jack and Jill,” of course I expected them to come tumbling down the hill. 🙂 Good one! Hahahaha. Lovely re-take on the popular rhyme. I am happy Jill is and must always have been the smart one. I just hope she doesn’t suffer for following him this time! Hmmm…does he say: Signs Schmigns again? What on earth is Jill going to do with Jack? So very glad it did!! What a delightful tale. I don’t guess Jill will ever learn.